Ever since Asha announced RCI: Karnataka, I have been wondering what to make. I googled a number of Karnataka recipes before finally deciding to settle for a gojju. 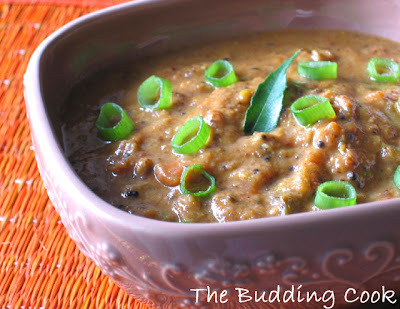 From what I understand, a gojju is a sweet-sour and spicy dish which is part of a traditional Kannadiga Oota (Kannadiga meal) and can be prepared using a variety of vegetables like eggplant, okra, tomato, pumpkin, onion, bitter gourd etc . It involves cooking the vegetable in a sweet and sour gravy which is prepared by using grated coconut, tamarind & jaggery. Generally, a gojju is prepared using just a single vegetable so that it imparts its own unique taste to the gojju. I came across dozens of gojju recipes on the blogs of my fellow blogger friends before deciding to make a simple onion and tomato gojju. I adapted this recipe to suit my taste and I must say I was not at all disappointed with the outcome. I am going to make this regularly. This is how I went about making this dish. Heat oil and add all the ingredients for the seasoning followed by the spring onions. Sauté till the onions are soft and transparent, and then add the tomatoes and cover and cook till the tomatoes are done. Add the chilli powder & sambar powder and cook for 2-3 minutes. Add the ground paste of the coconut and the roasted ingredients and cook for a few minutes. Add the tamarind juice along with the jaggery and a cup of water and let the whole mixture come to a boil. Prepare a paste of rice flour in some water and add this paste to the boiling mixture. Turn down the heat. Simmer for 5-7 minutes till the gojju thickens. This is being sent to Asha (Foodie’s Hope and Aroma), the host for RCI: Karnataka. So you too found a good recipe for RCI: Karnataka. Love the addition of spring onions here. Looks yummy! Am surprised to find spring onions in the gojju. Well done! Looks so nice. I make a similar kinda preparation with okra ,but I do not know it's name. My mom used to make it during some pooja.So,I always call it as 'swamy kuzhambu' (sound's stupid , I know). Will ask my mom about this and post it some time. Nice pictures. Love that beautiful bowl too. I loved the bowl first. very authentic sounding gojju. It looks delicious! I like thick and creamy dishes like that. And your bowl design is so wonderful!!! Hey... Spring onion gojju.. that looks lip-smacking!! I have been hunting for a tomato chutney recipe that matches the one served her in a South Indian restaurant. This might be the one I am looking for. that looks so yummy n creamy, I can taste it from here, slurp...slurp! I like the idea of this dish and green onions, one of my all time favourite things. Sometimes I just like to cut it up and sprinkle on my food to eat. This is very tempting 'The Blossomed Cook' - i hope to make one other kannadiga dish other than the ubiquitous BBB for Asha's RCI. Sorry but I forgot to mention that I tried your Pineapple Kesari(Halwa) recipe and my guests and husband loved it.. particularly when it was cold. Thank you TBC. Of course 2 tsp of sugar didn't work for me.. had to add a whole lot more.. maybe my pineapples weren't sweet enough but that's the only change I made. 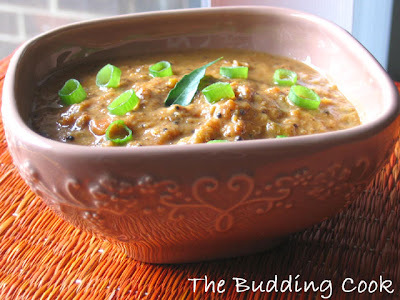 Looks beautiful TBC.I am from Bangalore and I can vouch that it is an awesome Gojju. simple and yummy at the same time... that's a winning combo!! i posted a "twin" that is more like a chutney :). me thinks your gojju will go very well with ragi mudde. Great ENtry for RCI.This gojju curry looks spicy. Kribha,ha ha... I love the sound of swamy kozhambu .And ifit's mom's prep, it just has to be good!Will wait for your post. Manjula, this was not meant to be a chutney:-(. Anyway, it tasted reallllllllly good. Do try it out. Laavanya, ha ha ha... the blossomed cook! Viji, thanks.Actually, I had this with rava dosas &onion chutney. It was soooooooo good! Bindiya, " full bloom cook"...lol:-). You are too kind! Seena & Raaga, thank you. You gals are so sweet. What a lovely dish! I'll have to try to find curry leaves around here. TBC, that is simply great & lovely pic... and I will give it a try..
Rachna, it was for me too. I had never made this before though all South Indian preparations are a lot similar in the style of preparation. Also, you will be able to find curry leaves in any Indian grocery store. I have not seen it in other place. awwww Linda, you are so sweet:-)I hope you are alright now. I like this recipe. My husband is Kannadiga, so if we make this, he's be a happy man. Lovely version. Never heard this before.